Wow, this makes me sad; seeing another place bite the dust! I definitely loved Eva Ruth’s Bakery in Middletown, RI when I went back “home” to see family! They had a full bakery and did a few sandwiches too. Friday, April 21st 9:00am – 3:00pm and Saturday April 22nd 9am – the sale of all prepared foods and frozen bakery products. First come – first served. Once again, I thank you for your dedicated patronage over the years and hope the best of health for each of you! Lesson: Please support the Gluten Free & Allergy Free places who’s sole existence is dedicated to keeping you and/or your child safe when eating out! Thank you Ruth for sacrifice on behalf of the Celiac and Food Allergy Community! Another GF/AF Cafe Closes It’s Doors; Wake Up Call! I know they had great products based on their reviews and how long they lasted in a sparsely populated area. They want to re-open but will have to re-invent the wheel in some way to get more customers. Lets look at what most likely happened to them. First; the population of Ellisville is only about 10,000 people; St Louis’ population is a little over 300,000 and we can add in sparser suburb populations. The glaring problem that I see is that another GF Cafe opened up in St Louis and a mini chain with 2 locations (dedicated GF prep space; Find Me GF App allows them to list as dedicated GF). That is a lot of competition! When the competitors arrived closer in to St Louis, less people were driving out to Ellisville. I can see from the above that they were struggling due to lack of customers/sales and when 3 competitors popped up, this is what took away quite a few of their customers and they could not survive. Maybe a move into downtown St Louis (3,0o0 Celiacs = 1% of population) will help. If each person with Celiac Disease was eating in Ellisville twice a month..they could probably have survived. However, I know from experience that this was not the case and I don’t believe that 4 establishments can survive given the limited number of people who actually need to eat at these establishments. A move closer in may work for them and they may put the other GF place out of business. The place that has 2 locations and also serves mainstream meals will survive because 99% of their customers don’t eat GF! Moo Cluck Moo no longer GF: (outside of Detroit with a population of 688,701) Last month, folks around Dearborn Heights, MI (population 95,000) and Canton, MI (population 90,000) were freaking out because Moo Cluck Moo (chicken place) announced on their Facebook page that they were moving from only serving GF buns to introducing regular buns and just offering a GF Bun option. Reviewers on the Find Me Gluten Free app went crazy, giving them 1 star ratings (after many five star ratings previously) and people were ranting and raving about how awful it was and saying that they would lose the support of the GF community. I understand that this is upsetting to the GF community; maybe they should have supported them more to begin with! There are also 4 other facilities showing as dedicated GF in the vicinity of Detroit; I can see why they had this problem. Supply and demand is the problem. I have to give you all the REALITY; neither of these places had the full support of the GF community; that is why they were forced to make the decisions that they are making! It is clear that not enough GF people (GF & Peanut Free in New Day’s case) chose to do this and to make matters worse and what pushed them over the edge was the competition; it spread the customer base so thin that it will be hard for more than one to survive staying completely GF. Moo Cluck Moo just decided it is not worth the headache because they can’t make a living. Think about it gang… is it worth doing it if you can’t take a paycheck or make a profit? This is a another wake up call for the GF/FA Community. These were very highly rated restaurants who responded to the pleas for safe GF/AF meals and were doing it right! What a restaurant cannot overcome is the lack of sales; which is due to the lack of support (people showing up) from the communities they serve. Many customers do support these establishments but not frequently enough and there are many reasons for this. Some reasons are the distance needed to travel, preferring to eat at mainstream restaurants who offer GF items (complain when they get sick) and finally there are those who just assume everyone else is supporting the GF/AF place. I am sure there was a small group of regulars who were supporting them. However; if most of the GF customers only show up once every 6 months, these businesses can’t survive and it is even worse when several completely GF places open up; supply and demand rears it’s ugly head and there just are not enough customers to sustain them all or sometimes even just one of them! *If they were in NY City, with a population of 8.4 million, not to mention tourists, there is plenty of room for competition! We are so thankful for our customers (6.5 years for our frozen food line and 4 years for our cafe, deli and bakery). You might be wondering what the population of Ellicott City, MD is…65,834 & close by Columbia is 100,000. We are not immune; we also suffer from the same common problem; lack of customers. All I can do is tell you what is going on; I can’t make you all support those doing it right; that is completely up to each one of you. These places will only stay in business by you showing up and creating the demand at the places who are doing it right. Thank you to New Day Gluten Free and Moo Cluck Moo for making a valiant effort on behalf of the GF & FA communities. I feel your pain and can truly say, “I get it”. Thank you for your efforts. A few weeks ago I was giddy, like a child, as we hosted a birthday party for 9 year old Matthew; who is Allergic to: Wheat, Rye, Barley, Peanuts, Tree Nuts, Egg, Shellfish and Sesame. The best part was that he was able to have Pizza, Cake and a Video Game Truck out in our outer parking lot. Even better; Matthew’s friend, Nick, also has a Milk Allergy and was able to come in and order whatever he wanted and enjoy the same cake as the rest of the gang! Twenty of Matthew’s closest friends and family were here at One Dish Cuisine Cafe, Deli and Bakery for some fun and safe food. I don’t know who was more excited, me or Matthew. It truly made my day to be able to provide a safe environment for him. Watching his excitement being able to have all of his friends at his own party was a thrill for me and the staff here too. The best part was that his friends were so thrilled to come to “Matthew’s Restaurant” and be able to eat a meal and have birthday cake with him; instead of Matthew watching them eat! His friends see him go without at school and at other children’s parties and they were so tuned in to how special this was for him. The best part is that all of the kids loved the pizza and cake. This is what makes me wake up and smile coming to work each day! Just give us a call if you need to set up a special day for someone in your life. Another GF Bakery/Cafe Closes! It always makes me very sad when I see a gluten free business close. A couple of years ago we saw Freedom Bakery in Severna Park, MD close it’s doors after 3 years. Magnolia Cafe in Byhalia, MS, closed in June, great food but in a town with only 3,000 people; they did not last long. 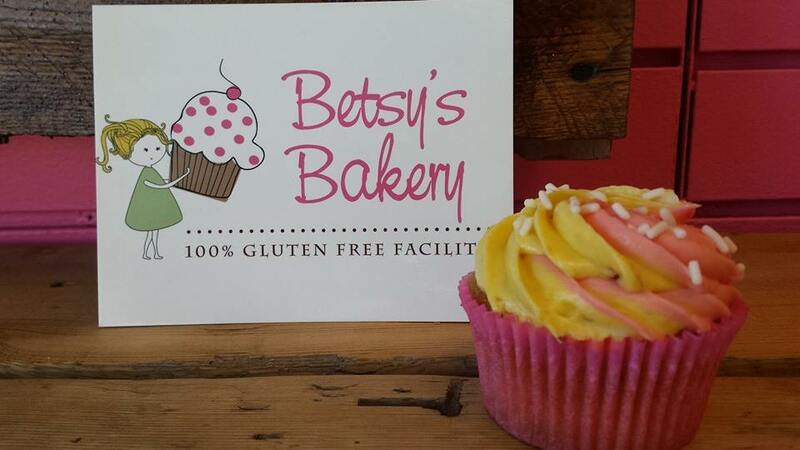 Now we have Betsy’s Bakery in Harrisburg/Camp Hill, PA closing their doors after 3 years. They notified the public via their facebook page on 8/1; with their last day being 8/8. This got me thinking about why this happens and ultimately, if they have a great product, it is usually from the reduced number of customers that these specialty bakeries/cafes struggle to serve. If people don’t come in, they can’t pay their bills. However, other factors can contribute to the demise; such as an inferior product and poor management. Most could weather the storm if they have a great product and the number of customers stayed constant. Betsy’s had a great product! We all know that gluten free and allergen free is more expensive. Why is it more expensive? It is supply and demand; business owners just can’t control that market factor which makes our cost of doing business much higher than regular restaurants or bakeries. The next big hurdle is the labor or manpower that it takes to make everything from scratch. When I talk with other GF business owners, our biggest frustration is that some of our customers say that they want a product that won’t make them sick; which we deliver, and then they complain about the cost. I hear that from customers too. They pay more in the grocery store for GF/AF products, why would it be different in a restaurant? -Coal Fired: 11.99 divided by 79″ = 15.1 cents per sq inch for 10″ round pizza; hope it is really GF! -Square: 7.99 divided by 64″ = 12.4 cents per sq inch for 8″ square pizza and hope it is really GF! -One Dish: 16.99 divided by 108″ = 15.7 per sq inch for 12×9 fresh pizza & know it is safe & have leftovers too! Knowing the above, when people come in and complain about the price when ours is made fresh, in our dedicated GF & AF restaurant, vitamin enriched and less than 1 cent higher in cost than the coal fired place and 3.3 cents higher than the square pizza place, it is all I can do to control myself! So, in summary, many reasons contribute to the closing of completely GF restaurants and bakeries and the biggest factor is the lack of customers compared to other mainstream restaurants/bakeries. The regular restaurants out there feed 95% of the population and we only feed 5%. Often I hear this statement from some in the gluten and allergen free communities; “there is no place safe to eat”. I don’t see how they can make that statement when they are not supporting the one that is safe and is within 5, 10, 20 or 30 miles of them! Here is an example. Last week, we had customers in for the first time; who live 12 miles away and have known about us since we opened. Two of the family members are Celiac and they just got around to coming in here; three years after we opened! They were so nice and I am so glad that they came in; I always say “better late than never”. However, GF/Allergen Free restaurants really need your support when they first open and throughout the year. You don’t want to make the trip only to find out that they went out of business last week; something that I think will be happening in Harrisburg/Camp Hill for a while! There is so much excitement in GF media when a chain starts offering GF menu items. Where is the excitement for the completely GF/AF place? It is my hope that customers will realize this and support their local GF/AF free restaurants, who have risked it all in order to safely serve them. These restaurant owners are the ones who give it all, risk it all and lose it all if they are forced to close. So, if you live near a dedicated bakery or cafe that offers a great GF/AF product, please support them. If they close and have a great product, it is usually from not enough customers; especially if they have been in business for a while. As always, thank you to all of our customers who keep us going here at One Dish Cuisine Cafe, Deli & Bakery. Also, a big thank you to all of those who have given all and started a GF Bakery/Restaurant to serve their communities!